Buzzword of the Day: Resilience! Greetings all! Now that the end-of-semester rush and my apocalyptic finals season are over, I’d like to follow up on my post about language and climate change. Words like adaptation and mitigation are as important as ever in considering our best responses to climate change. What’s changing is how we look at managing our ecosystems and our human systems. A takeaway message I got from the American Water Resources Association conference, the UN climate negotiations simulation at Duke, and the IPCC’s newest report is that our goals now include a different word. Our rhetoric on climate change now emphasizes the word resilience. In fact, I took an entire class on resilience this semester. The class is called Ecological Resilience and Ecosystem Management, taught by Dr. Jim Heffernan. I have to say, I’m not an ecology person. I never had a knack for it. In undergrad I tried hard to avoid studying living things altogether. But going into grad school, I recognized the fact that living things tend to live in water. And understanding the entire ecosystem is important for understanding how water behaves within it. So I took this ecology-focused class, and I was forced to admit: I liked it! I liked an ecology class! Who would have thought?! I hardly know myself anymore! I can’t seem to study water without encountering living things. 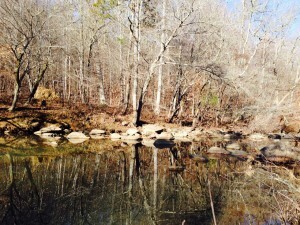 This is New Hope Creek in Duke Forest. I liked how glassy the water was, and how the trees reflected in it. But don’t get too excited, it’s not like I’ve been converted into an ecologist. The class was pretty broadly focused on the theme of resilience, whether in ecosystems or in larger socioeconomic systems. I’ve had my eyes opened to how big of a topic resilience is—and how relevant it is—across scientific, social, and economic disciplines. Resilience is the ability of a system (an ecosystem, a city, an economy, etc.) to withstand changing conditions. A measurement of a system’s resilience is how big of a disturbance or change of conditions the system can withstand without dramatically altering course. When we think about climate change, we think about how we can better prepare our human and ecological systems to exist and evolve under changing conditions. These conditions include sea level rise, rising surface temperatures, melting glaciers, more frequent hurricanes and storms, changing precipitation patterns, drought, and so on. Another definition of resilience is the ability of a system to bounce back after a disturbance. While this definition is of interest to the ecological community, I found that it was not really prevalent in the climate change and water resources conversations that I’ve had in the last few weeks. After all, the ideal situation is for our cities, our populations, and our economies to withstand disturbances, and not for us to hit rock bottom after a major disturbance (like a hurricane) and see how well we can rebuild. We manage for the resilience of cities just as much as ecosystems. 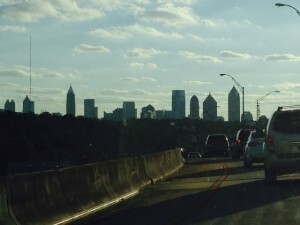 Here’s my beloved Atlanta skyline, which I always miss when I’m away. Similar feelings do not apply to the traffic. For example, think about Hurricane Sandy. At the AWRA conference, a few people talked about how we want to build the resilience of those northeastern communities to future storm events, so that they can be more resilient to a future hurricane. We’d prefer thinking about the type of resilience that lets us focus on how to survive and evolve in the face of future disaster, not how to recover after the fact. My point is, it’s important to think about resilience to disturbances like drought, floods, or hurricanes (all water-related! Water is everywhere, don’t ya know) because reports like the IPCC indicate that these disturbances will only become more frequent in the future, and the risks associated with these events will be higher. So if you’re a prospective MEM student and you’re considering what kinds of subjects to study up on, I highly recommend looking into the rhetoric behind managing for resilience. 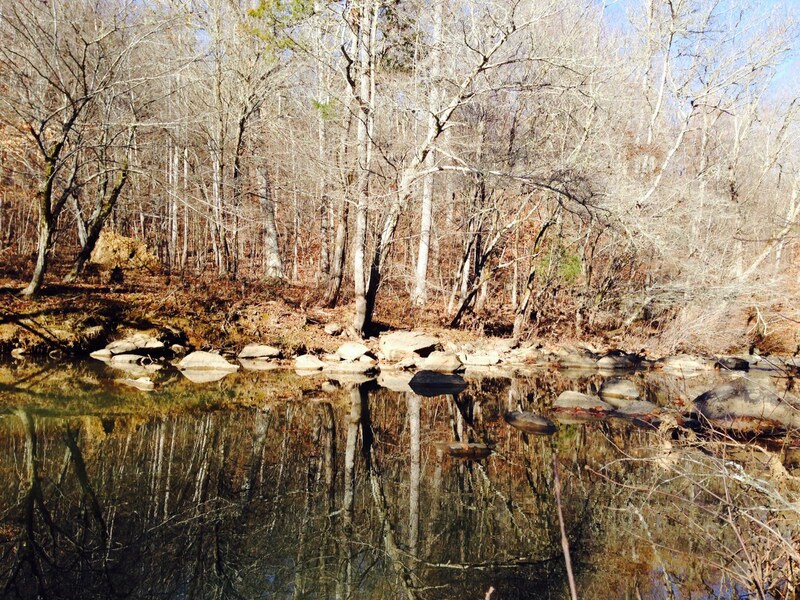 In Water & Peace, Meagan discusses climate change issues, especially relating to water resources; adventures in navigating the MEM program; and explorations of the great outdoors of NC (or really any place that is out of some doors).